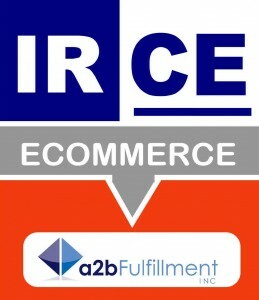 E-commerce merchants are busy getting ready for the annual Internet Retailer Conference (IRCE) to be held in Chicago. Events kick off on Tuesday June 10th and conclude on Thursday June 12. This is a great opportunity to enjoy the largest e-commerce industry event in the world. It is jam-packed with educational presentations and hundreds of exhibitors and industry experts. Visitors to our Booth #1308 will discover how outsourcing fulfillment for e-commerce merchants can improve efficiencies, lower costs and make them more money. There are five main reasons that a2b Fulfillment is unique from other third party fulfillment centers. a2b is built on the philosophy of speed. Same Day shipping made us famous. This high standard along with our strategic SE location combine to make our ‘Ship Smart. Save Money” story quite simple and powerful. We reach most consumers in 2 days or less via the least expensive shipping method – ground. Along with our logic-based shipping software, our systems will always choose the most economical shipping method required to meet the delivery goal. E-Commerce merchants want to build a loyal customer base. Top notch Customer Care is essential. Who better to provide this service than a highly trained and motivated team of service and product specialists working under the same roof where your products are shipped from? That means that we can touch and feel our e-commerce merchants’ items and also identify issues within minutes, leading to quick, cost-saving resolutions. Merchants can leverage a2b’s order management technology to better manage the customer relationship. They will see how our systems process payments and refunds with ease, all within a PCI Level 1 Certified environment. This enables them to gain insight on their customers through our extensive reporting capabilities. Our system integrates easily with most shopping platforms. Returns – they’re inevitable. a2b’s “Returns to Profit” program shows merchants how to leverage a good returns process to make happier, loyal customers AND save or even make money in the process. a2b offers services on an a la carte or turnkey basis. When we meet with prospective clients we review their needs and together we build a solid back-end support system. Sound too good to be true? Whether you are considering attending IRCE or not, contact us today for more information. At the show we can be found at Booth 1308.